“The Suicidology” is an international multidisciplinary journal featuring original research articles, scientific reviews, point/counterpoint discussions on controversial topics in suicidology, as well as the current updates on the clinical, psychological, and social aspects of suicidal behaviour and autoaggression management/prophylaxis. Topics of interest include legal, economical, historical and other aspects of the suicidology. The authors are psychiatry and/or multidisciplinary professionals both from Russia and other countries. The journal is published in Russian with English abstracts provided for each published piece of material. “The Suicidology” was founded in 2010. The journal is registered in Federal Supervision Service in Communication, Information Technologies and Mass Communication, Moscow, Russia. The journal is included in Russian Science Index. The journal is included in Web of Science (ESCI). 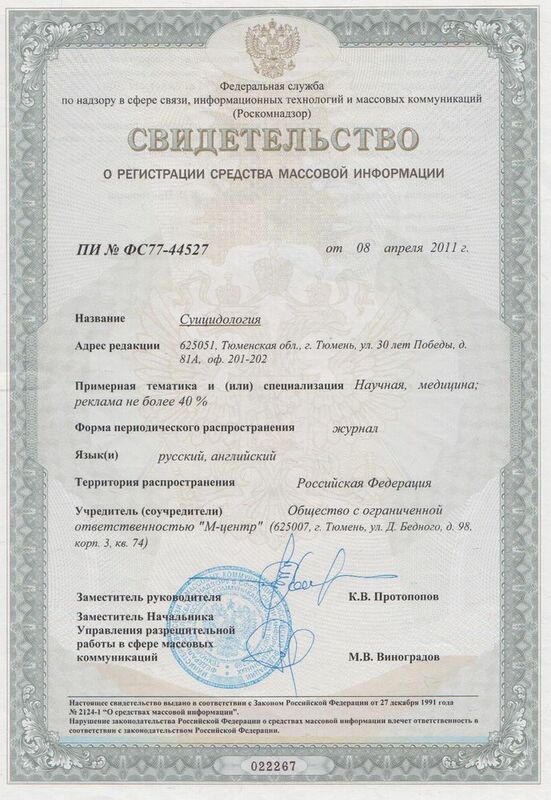 Subscription index in Russia Сatalogue of Scientific and Technical Information (STI) "Rospechat": 57986. Publication periodicity: four times per year. Disptibuted through subscription. The Journal founder and publisher: "M-center", Ltd. The journal is printed via ready-made set in “Vektor Buk” publishing house.